Canadian Prime Minister Justin Trudeau is under new pressure after his former justice minister released documents relating to a major corruption scandal. Jody Wilson-Raybould says government officials tried to persuade her to shield SNC-Lavalin from prosecution. The Canadian firm is accused of bribing officials in Libya to win contracts under Muammar Gaddafi's regime. Ms Wilson-Raybould has released the recording of a phone call and other materials to support her accusations. The files, initially given to a parliamentary committee, were released publicly on Friday. They are likely to increase pressure on Mr Trudeau, who is facing a general election later this year and has struggled for weeks to contain the fallout from the controversy. SNC-Lavalin is facing claims that former executives paid bribes to win contracts in Libya under Gaddafi, who was ousted in 2011. The Liberal prime minister has been accused of pressuring Ms Wilson-Raybould to push for a legal favour for SNC-Lavalin that would allow it to avoid prosecution and instead face alternative penalties, such as a fine. 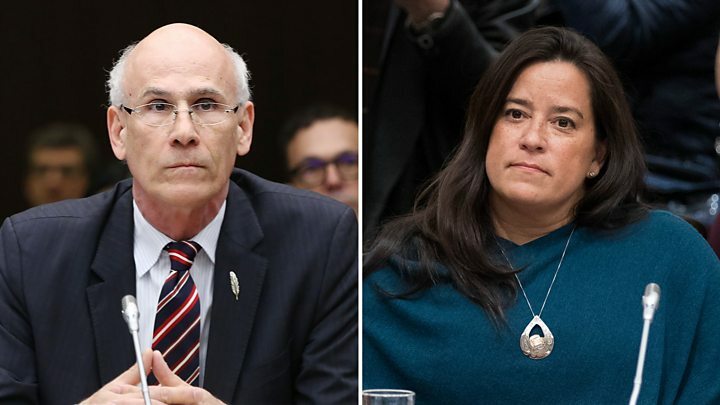 The affair has seen the prime minister lose two senior ministers - including Ms Wilson-Raybould, who resigned from cabinet in February - as well as Canada's top bureaucrat and a senior aide. Mr Trudeau has denied any wrongdoing by either him or his staff. But opinion surveys indicate that the controversy has shaken Mr Trudeau and his government's popularity months before the election, which is due in October. Mr Wernick stepped down as Canada's top civil servant this month.